Although this recipe may be more labour intensive than what you’re used to, we say it’s definitely worth the extra effort. Wow guests at your party with these dainty canapés. 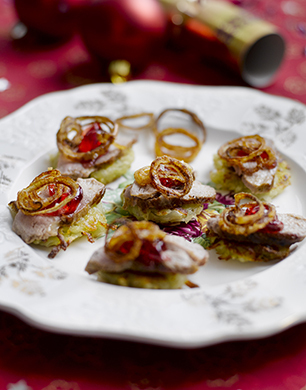 Great for Christmas and parties all year round, the flavour combination of duck with redcurrant jelly and crispy shallots is mouth wateringly good. Mix the potato, shallots, flour, sea salt and freshly ground black pepper in a bowl. Add the oil to a heated pan. Using a teaspoon, spoon out heaped teaspoons of the mixture into the hot pan, turn to a low heat and flatten down, creating separate small discs of rosti. Fry until both sides are crisp, remove from the pan and remove excess oil on paper towels. Place to one side. Heat the oil, test it is hot enough by dropping a piece of shallot in and checking it bubbles and crisps. Separate the shallot slices into rings and place them in a medium bowl. Make certain the shallots are not moist, otherwise they may splatter when they go into the oil. Sprinkle flour over the shallots and toss them lightly to coat evenly. Working with a small quantity, sprinkle the shallots into the oil and stir gently to keep them separated. Fry until golden brown, about 5-6 minutes. Remove with a slotted spoon, then put on paper towels to drain off the oil. Sprinkle with sea salt whilst still warm. Continue frying the rest of the shallots, salting each batch whilst it is still warm. Trim any excess fat from around duck breasts and score the fat in a diagonal motion several times. Season them with sea salt and freshly ground black pepper. Place skin side down into a hot pan. After about two minutes turn over, then place into the pre-heated oven for 8 minutes. Put the potato rosti in with the duck breast for the last minute to warm. Remove the breast and rosti from the oven let the duck breast rest for 5 minutes. To serve, remove the skin (it can be left on if desired.) Slice the breast and place pieces on top of each rosti, place a spoonful of the crispy shallots on top of the duck. Top with a little bit of redcurrant. Note: If you do not have sufficient time to make the rosti, readymade canapé blinis could be used.